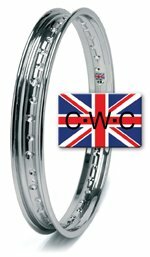 This is our own brand of British rim, rolled to a replica of the popular Dunlop rim of the 1960’s. 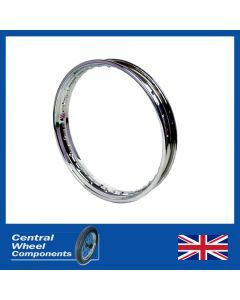 This high quality, bespoke rim is hand polished prior to being dimpled and drilled to your specific requirements. Then it is triple plated using copper, nickel and chrome to BS EN12540 (service condition 4) ensuring a high quality finished product. 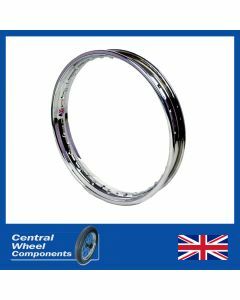 All rims are stamped ‘Made in England’ and because each is individually made to your requirements, you need to allow 28 days for delivery. Different dimple patterns are available or you can choose undimpled rims. We also supply rims in bare metal suitable for painting, powder coating or alternative plating.